Introduction: A paucity of literature exists pertaining to the role of leaders during the health response to disasters. The minimal published literature regarding disaster leadership suggests that health leadership in a disaster should adopt an approach similar to that of professions such as law enforcement, military and freighting. 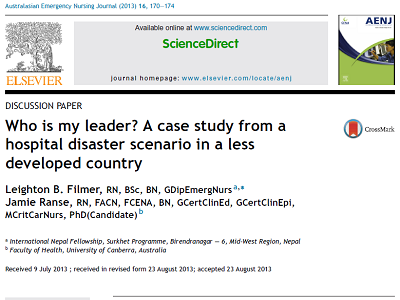 Aim: This paper aims to describe observations pertaining to disaster leadership during a mock disaster scenario. Background: This case study is set in Surkhet, Nepal, a small city prone to disasters such as earthquakes and floods. This case presents a mock disaster scenario of an earthquake set at a nongovernment health facility. Methods: Observations were made of the performance of responders in establishing triage, treatment and command centers. Results: Institutional leaders among the responders struggled to apply the disaster plans in the face of spontaneous disaster leadership. Conclusions: Both the recognised leadership of an organisation, and those who in a disaster may step up as disaster leaders need to be confident in implementing the disaster contingency plans. Leadership in disasters must have a clear distinction between incident controller and ‘clinical leader’ roles. Discussion and recommendations: This paper provides recommendations that may have applicability to leadership in real world disasters.